Dr. Michael A. Rees helped a man from the Philippines who could not afford a transplant get a new kidney from an American donor. Dr. Michael Rees, a University of Toledo Medical Center kidney transplant surgeon, has spent more than a decade developing ways to increase the number and quality of kidney transplants in the United States through a program he founded, the Alliance for Paired Donation. Now Dr. Rees, who is also a professor of urology and pathology at the former Medical College of Ohio, is taking his expertise to focus on finding people in developing countries who don’t have the financial means for transplants, while increasing the number of kidneys available for U.S. patients. 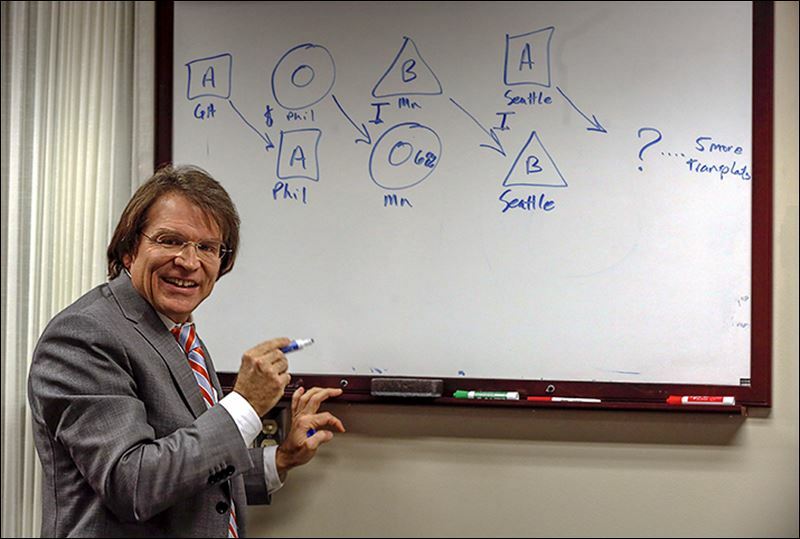 Dr. Rees calls his new program reverse-transplant tourism. A husband and wife from the Philippines, Jose and Kristine Mamaril, are the first participants to benefit from this innovative system that allowed Mr. Mamaril to receive a life-saving transplant in Toledo from an American donor in Georgia. His wife, who has a coveted blood type, reciprocated by donating a kidney to a man in Minnesota who previously would have had to wait years for a match. According to the website Kidneylink, the average wait for people who need transplants and lack matching donors from their families varies between three and five years. “In rich countries there’s not enough kidneys for people who have kidney failure, but there is plenty of money to pay for all the transplants. In poor countries, there’s lots of people that need kidney transplants and lots of available donors, but in poor countries they don’t have enough money,” Dr. Rees said. This new program breaks down some of those barriers and helps bring people with the universal Type O blood into the U.S donor system, while helping someone from another country get access to free medical care. One year of a kidney patient’s dialysis costs Medicare about $90,000, or nearly triple the $33,000 cost of a kidney transplant, Dr. Rees said. He argues his donor-matching system will ultimately save the federal government and private insurers money because it moves patients with kidney failure, also known as end-stage renal disease, off dialysis sooner. “It is what health-care reform is all about. It increases access, so now poor people are getting access to transplantation. It reduces the cost of care and it improves the quality of care because a transplant’s a lot better than dialysis. The average person who gets a kidney transplant lives 10 years longer than if the same person had they remained on dialysis,” Dr. Rees said. Mr. Mamaril, 31, had nearly given up hope of ever being able to afford a kidney transplant at home in San Pablo, in the Philippines’ Laguna province. He told his wife they could afford neither the transplant nor dialysis and tried to persuade her to give up on him and save their meager money to take care of their 8-year-old son. The Mamarils are not poor by Philippine standards. Both college-educated, she is an accountant for Dunkin’ Donuts in Laguna while Mr. Mamaril had been operating a taxi business that transports passengers using motorcycles with trailers. Everything changed for the family when he began to feel weak and dizzy in October, 2013 — a symptom of his kidneys failing. By the following January he started dialysis, but the couple had to borrow money from relatives to pay for it. Mr. Mamaril, often speaking through an interpreter, said he worried constantly about how to pay for his expensive medical care. Dialysis or a transplant cost 10 times the family’s income, Dr. Rees said, and the Philippines has no public health system to help pay for transplants. Jose Mamaril received a kidney from a donor in Georgia through the ‘reverse transplant tourism’ program. In return, his wife, Kristine, donated one of her kidneys, which did not match her husband, to a recipient in Minnesota. Mr. Mamaril sold his taxi, and he and his wife sold every piece of furniture in their home. His wife took her bank card to a pawn shop and agreed to have her future wages garnished to get money for his care. But it still wasn’t enough. “They never gave up on me,” he said. The only thing that kept him going was the thought that “my son needs me,” he said. Mr. Mamaril calls it a miracle. The doctor who had been treating him at the hospital in Manila, Dr. Siegfried Paloyo, had worked for a short time in the United States, where he met and befriended an associates of Dr. Rees. The mutual friend brought together the two kidney surgeons who were thousands of miles apart in different countries. Dr. Rees had developed the idea for his reverse-tourism transplant program, but he needed to find a developing country that had a medical structure in place to support ongoing care for kidney patients. “The transplant infrastructure in the Philippines was well-developed and Don was an excellent doctor,” Dr. Rees said. Dr. Rees asked Dr. Paloyo to find a couple who were struggling financially and whose kidney donor would have Type O blood, the universal-donor type that can be received by nearly anyone. He also preferred a kidney patient with Type A blood, because that person would match about 85 percent of the U.S. population. Jose and Kristine Mamaril fit the description perfectly. Dr. Rees raised $150,000 from private Toledo donors and invited the couple to come to UTMC to be his program’s first participants, but getting all the pieces in place for the exchange took several tries. After five different attempts to match Mr. Mamaril with an American donor, the couple finally arrived in Toledo on Dec. 3. Mr. Mamaril said his faith helped him get through the months of medical procedures, having his hopes dashed when donors didn’t match, and watching his family fall into abject poverty. At 7:30 a.m. on Jan. 6, the three-way kidney exchange began. Mrs. Mamaril’s donor kidney was removed and sent to Minnesota. The kidney intended for Mr. Mamaril was removed from the man in Georgia and flown to Toledo. By 4 p.m., Mr. Mamaril was in surgery receiving his new kidney. Sitting in a UTMC conference room two weeks later, he said he felt great. “I’m so happy I get my new kidney. I still believe in God,“ he said. Mr. Mamaril also had an opportunity to talk with his kidney donor via a video conference call between Toledo and Georgia. “He said, ‘Thank you and I love you,’ ” Mrs. Mamaril said speaking for her husband. Dr. Rees said he now has an even larger task ahead in trying to create a system where his reverse-transplant tourism program is sustainable. He is working to convince private insurance companies this program will help more Americans get kidneys and save them money in the long term. Lets solve problems at home first. Between a third and half of all organ donors are living organ donors. They are the unsung heroes of the transplant story. Unfortunately, they often are left with non-medical out-of-pocket expenses that can weigh heavily on them financially. This is Americans -- many of whom would like to donate but can't for financial reasons. We should encourage programs that allow Americans to help Americans.